This seems like common sense at first glance. 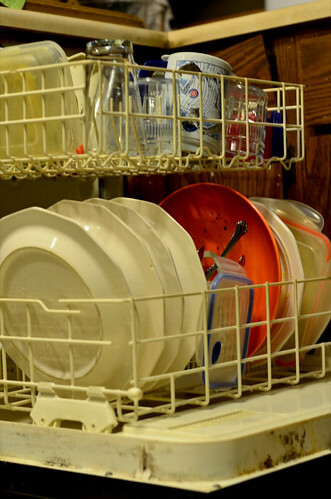 If you run your dishwasher, your washing machine, or your dryer with only half a load of clothes or dishes, you’re losing out in terms of efficiency. What about energy costs? Numbers vary, but the sources I’ve seen seem to estimate that a small load of clothes (say, half a load) will use somewhere between 60% and 75% of the energy of a large load of clothes. In other words, a single large load saves you about 25% to 50% of the energy of two small loads. In terms of dollars and cents, depending on your washing machine, the annual savings can easily add up to $10 or more. Similar principles apply with dishwashers. A single full load uses more water and more energy than a half load, but a full load uses far less energy and water than two half loads. So, why would you ever not run a full load? Perhaps you have a specific garment that you wish to wear. If that’s the case, hand-washing a single item is quicker and far more efficient than running a load of laundry. Just simply wash the item in a sink with a bit of detergent. Soak it in water with a bit of detergent, then wring it out and repeat a few times. Rinse it, then hang the garment up to air dry it and you’re done. What if you’re single and don’t have that many clothes? This was a challenge I had when I was single. For a time in college, I had just over a load’s worth of clothes. I would literally wear my last set of clean clothes on a Saturday while doing my laundry. The solution is pretty simple: develop a clear laundry routine where you wear your last set of clean clothes while doing your laundry. Sometimes, you have a small set of garments that have specific washing instructions. Again, if it’s a single item (or two or three items), wash by hand. If you’ve got a small load of these items, add items to the load that can easily wash with those specific instructions (like t-shirts, which clean well in almost anything). Similar principles apply with dishes. If they’re special items, wash them by hand. Otherwise, fill up your dishwasher (as much as you can) before running it. It’s that simple. Running a full load saves you time and money. It’s just a matter of choosing to do it.